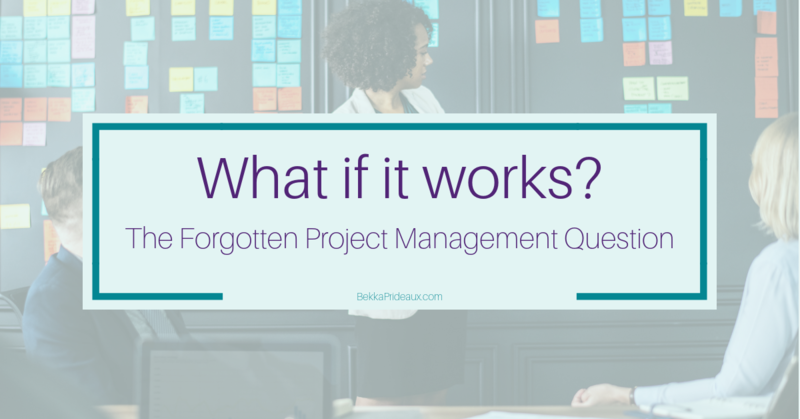 The forgotten planning and project management question: What if it works? You’ve planned for every eventuality… but have you planned for success? This is something we tend to overlook when project planning, so don’t forget to ask yourself this vital project planning question. When faced with a project, a programme or even just a big piece of work, as project managers we tend to start by getting clarity on what we want to deliver and how we will know if we have delivered it. Then we will make a plan. We will think about all the things that could go wrong and how to manage those risks. We will question and interrogate our plans: what could go wrong? What if this doesn’t happen? What if that’s late? What if the unexpected happens? But recently, as I chatted to the managers of some very successful projects, it struck me that we may all be missing something in our planning processes. A vital project planning question. It’s a trap I have fallen into, too. We get very creative in coming up with unlikely events taking our project off track and, yes, I do know of an IT project which was taken off track by a cannonball, so it’s not without reason. But projects can and do go well and this can present its own issues. If you are running ahead of schedule, will the team be ready to start work on the next stage of the project? A project manager I spoke to was lamenting the fact that they had not brought resources in early enough on a project with tight timelines. On delivery day, a critical go/no go decision came in three hours early but the people who could make the necessary system changes were not available until the originally expected time. This left the mission-critical project sitting waiting, while the managers watched the clock nervously, hoping there would be no problems later in the day – again, planning around what could go wrong! What if your project goes well and your results are better than expected? Will you have the capacity to manage them? I once led a team development and engagement programme which resulted in such a high level of participation that I had to find an extra two days a week to keep the momentum going; it’s a great problem to have but not a scenario I had planned for! What if what you are working on goes well? What would that mean for you? Do you have a plan in place? To an extent, as project managers, we are paid to consider and plan for what could go wrong but are we really doing our jobs of we do not consider both sides of performance, the good as well as the bad? Since what we plan for and focus on is what tends to happen, could we boost our project performance by planning for success? Let’s bring this question to the front of our planning. As you go through your scenario planning for your next project, your next programme or your next big piece of work, as well as considering all the things that could go wrong I would encourage you to reinstate the forgotten project planning question: What if it goes well?